Data published by Eurostat show that Romania recorded the second highest annual growth rate in imports of non-EU chemicals from 2007 to 2017 (13.1% per year, right after Ireland, with 13.2%, but Ireland had a surplus of EUR 27 billion) and was the last in terms of percentage increase in exports in the same period and relationship (only 2%). The minus registered by Romania in this trade balance doubled in 2015 compared to 2007 and tripled last year (from EUR -193 million in 2015 to EUR -384 million and EUR -566 million last year). Basically, here we find one of the main explanations for the expansion of the deficit on the relationship with non-EU countries, occurred over the last three years. It should be noted that the category of organic chemicals includes, under the SITC international standard classification, inorganic chemicals, dyes, pharmaceuticals, essential oils, fertilizers, raw or processed plastics and other chemicals. We recall that the reduction in production capacities and the competitiveness problems facing the chemical industry led us last year to a negative balance of almost EUR 7.3 billion only in this segment of foreign trade, equivalent to 56% of the total trade deficit or almost 4% of GDP. The EU is by far the largest exporter of chemicals in the world, with sales of about EUR 333 billion in 2017 and an impressive positive balance of over EUR 138 billion. A balance that has doubled in the last ten years, from +EUR 76 billion in 2007 and to which Germany’s performance contributed. A country that obtained an increased surplus on this trade segment from EUR 24bn ten years ago to EUR 50bn last year. To keep in mind, only five European countries have a trade deficit on chemicals in the non-EU relation (Greece, Slovakia, Malta and, rather for reasons of taking of raw material, processing and sales in the single market, the Netherlands and Luxembourg, with Bulgaria being practically in balance with –EUR 2 million). Quite strangely, Bulgarian exports of chemicals to non-EU countries almost reached those of Romania (EUR 938 million compared to EUR 951 million), while ten years ago they represented about three quarters (EUR 591 million versus EUR 779 million). 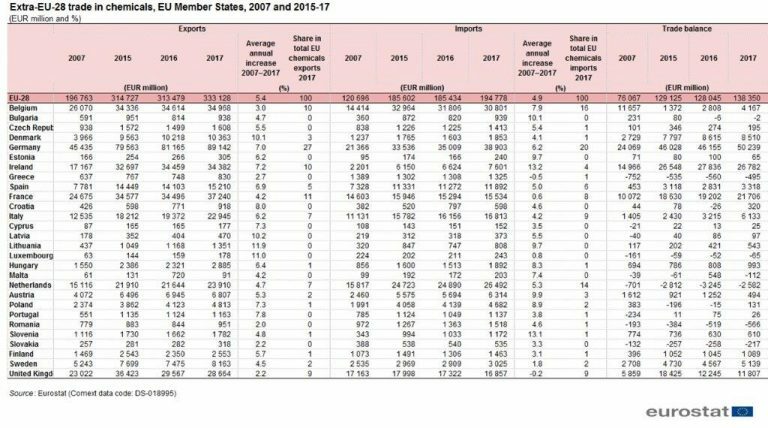 While we are advancing at the speed of a snail, another Balkan state that recently joined the EU, Croatia, has doubled exports and is getting close to us, although it has a much smaller economy (from EUR 426 million in 2007 to EUR 918 million in 2017). Our reference country in terms of size and structure of the manufacturing industry, Poland, also had a doubling as it advanced from EUR 2.374 million in 2007 to EUR 4.813 million in 2017. Only this way it managed to remain competitive, maintain on the edge of the balance and obtain a small surplus last year (+EUR 131 million). Of course, it is very difficult to compete and have success in a European market that is the one dictating the global market. However, it would have been much easier for us to focus on non-EU areas where we were massively exporting once and our products were recognized for their quality. Unfortunately, the countries that once were our customers did not stay still and, overall, we got to have a deficit in relation with them. 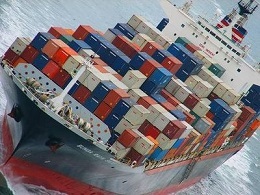 This is a critical area of our foreign trade. Without improving the situation and reversing the clear negative trend we registered, with this loss of competitiveness both in relation to the EU and non-EU countries, it will be very difficult to stop the minus in trade exchanges to become more chronic, a minus of which chemicals have a majority share.